A group of 7 senior design students at the University of Utah needed to build a racecar. They needed material, and they needed it affordable, and to withstand temperatures up to 400ºF. Most of all, they needed it to work. What they got was all of that, and then some: $8,000 dollars worth of LAST-A-FOAM® FR-4700 High Temperature Tooling board. With no experience whatsoever using polyurethane foam, the students embarked on a journey that embodied everything college is supposed to be about: learning. The racecar was to serve a dual purpose: to fulfill their senior design project assignment to make a monocoque, and to enter the car into the Formula SAE (Society of Automotive Engineers) competition, all in less than 9 months. Formula SAE is an international, annual competition for students to design, fabricate and engineer a racecar. Hundreds of colleges worldwide compete (although it’s known in other countries as Formula Student), and the stakes are high. Cars are judged by factors such as performance, handling, acceleration, braking, manufacturing feasibility, and cost. Hypothetically, the winning design would be contracted to manufacture 1,000 cars. This competition is no walk in the park, and considering the University of Utah was in the difficult position of starting almost entirely from scratch, they knew it would be a small miracle if they finished the car in time to enter the competition. The project was lead by Gabe Gray, whose passion for and knowledge of racecars is both impressive and intimidating. However it enabled him to lead the project with a pragmatic outlook. It didn’t take long for the team to realize that making the competition just wasn’t feasible. Instead they set their sights on something that would have a larger impact on the university’s program as a whole. They decided to focus this year’s efforts and resources on the overall design of the car, especially the monocoque, which Gray considers to be the most important single component of the car. With a good design in place, next year’s University of Utah Formula SAE team will be able to spend their valuable time completing and optimizing the rest of the car, setting the team up to enter the competition with a competitive car in 2015. The end goal was to create a carbon fiber monocoque, which is a term used in the racing industry to refer to the structural shell of the car. In order to get the final shape, the team needed a female mold that matched the outer profile of the car. A popular method many Formula teams use to make a monocoque is to make a plug (or buck) using a ladder frame and then fill the gaps with expanding foam. However, this method has several drawbacks, the biggest of which being that it’s extremely time intensive and likely inaccurate because the plug must then be sanded to shape by hand. Furthermore, a significant amount of prep work must be done before making the female molds. Gray said he was initially drawn to polyurethane foam because he liked the idea of being able to machine the net shape without significant post processing. This would not only save precious time but ensure higher accuracy. The University of Utah team began their relationship with General Plastics after looking online for machinable tooling foam options and coming across General Plastics’ website. “One of our team members emailed them, and they immediately agreed to work with us,” Gray commented. Six emails later and The University of Utah received $8,000 dollars worth of foam in the form of two 4’x8’ sheets, 12” in height. 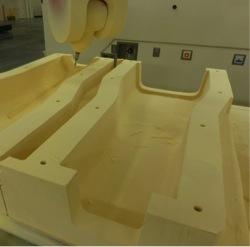 After female molds were designed in SolidWorks, the team took the foam to be machined at Janicki Industries’ state of the art facility in Utah. “The material we used, the FR-4700 high-temperature tooling board, machines like butter, and the finish sanding was incredible,” said Gray. Curing the carbon fiber and foam, however, proved to be a bit trickier. “Our biggest problem was that the foam has a CTE (coefficient of thermal expansion) significantly higher than the carbon fiber,” said Gray. This posed the risk of the mold essentially crushing the monocoque, therefore making it difficult to remove without damaging either the parts or the molds. The team circumvented the issue by curing for a longer time at a lower temperature, and the molds only suffered minor (and patchable) cracks. When Gray first set off on this mold-making journey, he intended to make a mold that would last 4 or 5 years. Although after getting a taste of the possibilities, Gray confessed that there are many other ideas he’s itching to try. Next year, however, Gray will be supporting the University of Utah as a competitor. He will be continuing his mechanical engineering studies as a graduate student at Oregon State University, an SAE powerhouse (they won this year’s Formula SAE Michigan), and Gray has been recruited to join the Formula SAE team there. Until Gray, Oregon State has never invited an outsider to work with the team as a graduate student, a testament to Gray’s value as an engineer. Overall, Gray is happy with the outcome of the monocoque project, as he should be. For never having worked with polyurethane foam before, what Gray and his team were able to accomplish is beyond impressive. General Plastics is grateful to have been approached with the opportunity to help the students. The company is always looking for new and innovative uses for their products, and this project is a great example. Getting to put their foam in the hands of young, bright students was the perfect way to introduce polyurethane to a new generation while doing their part to give back. 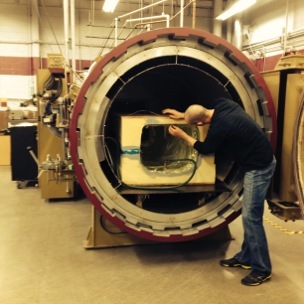 General Plastics looks forward to seeing the University’s program continue to grow and improve.